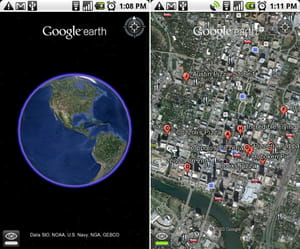 Google Earth is the Android version for viewing the world in 3D. This enables to discover cities, streets (Street View option) directly on an Android mobile phone or tablet. It offers satellite images that fit automatically the touch screen of the device. The app's interface is intuitive making it easy to handle. It is developed by Google Inc.
Map: Google Earth integrates a large database containing the World map displayed in 3D. It can put on show all cities in the world with all buildings and greeneries in the city. It is possible to pinch and stretch the image to get it more detailed. Information display: this application offers the possibility to the user to be aware of several kinds of information related to a given city. Google Earth can display Street and Highway numbers. Some important buildings with their names can also be found out with Google Earth. Street View: this function enables to visit cities and freely discover Streets located in the surrounding. It also offers the possibility to access the inside of some buildings such as Museum or Art Gallery. Images are displayed in a series of pictures offering 360° view of the room. Itinerary: Google Earth can calculate the shortest itinerary from a city to a given location on the map. For this, the user just has to specify the start (A) and end points (B). It can unveil the distance to ride (by car, bus, and bicycle or by foot) per mile and hour. Google Earth is essential for Android users. Elements can be sorted to facilitate browsing. Latest update on September 22, 2016 at 04:39 PM.